At Invitations Made to Order, we prefer to avoid expensive advertising campaigns simply because we’d rather offer a wide selection of products at a great price. In fact, our customers like to advertise for us! Most customers are so happy with our great selection and amazing full service options, that they tend to refer their friends and family to Invitations Made to Order. Have you seen our small ads in local publications? We keep them small, so that we can keep our prices down and pass the savings to our customers. Here are the ads that we ran in the Detroit JN. 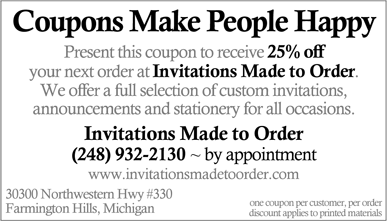 And as a thank you to our clients, we’re offering a special online exclusive coupon good for 25% off your next order with Invitations Made to Order. All you have to do is contact us to schedule an appointment, print out this coupon, and bring it in when you meet with us so you can get 25% your entire order. We think that this coupon will make you happy. Enjoy - and contact us soon, because this is a limited time offer. This coupon requires the free Adobe Reader. One coupon per customer. Please present coupon before placing your order to receive this special promotional offer with Invitations Made to Order. Thank you.